A couple of weeks ago I mentioned I was the winner of Black Purl‘s very first monthly drawing. Check it out becase there’s still time to enter the December drawing, which will be for a Following Yonder Star art card, suitable for framing. 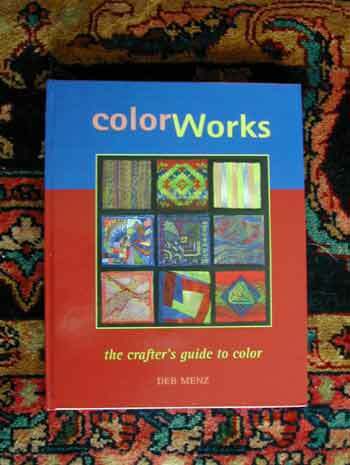 The November prize, which I received on Saturday, was a copy of Color Works: The Crafter’s Guide to Color by Deb Menz. As a new designer, I’m thrilled to have this useful tool. Thank you, L’Tanya! Today I signed up for L’Tanya’s free, one-week e-course called Make it Sacred. It’s about creating a space in your home that’s special and just for you; a space that nurtures your soul. Not only does it sound exciting, but there’s also a very attractive (if I may say so myself) button for it, created by yours truly. L’Tanya is the founder and editor of Black Purl. The goal at this intriguing new magazine and website is “to foster a sense of community among needlecrafters; a unique, virtual playground where artists can share their love of crafts.” It’s for all needlecrafters–quilters, knitters, crocheters, tatters, embroiderers, beaders, and more. At Black Purl, you can download the premiere issue of the magazine for free and sign up for the free newsletter, Purls of Wisdom. I found your site about a week ago and am just doing cartwheels over it! I love to knit and crochet, it’s become a huge part of my life lately. It’s wonderful to find a site dedicated to crochet, thank you for making it just as fun and rewarding as knitting! I love you’re blog and ceep coming back to it. I’ve posted the button on my log and joined the list. I really like the book. It has opened up my eyes to new concepts in color. I’ve signed up!!! Being that I just moved in my place I have a corner I’d like to make a special spot. I love the vibe too and thank you for linking your readers up to it :) It’s funny being a knitter too, but the moment I read ‘Black Purl’ I didn’t automatically think knitting..I had thoughts of exactly what it was!! !